As shocking as it may seem, you can't register a book-frame Locost in Australia. 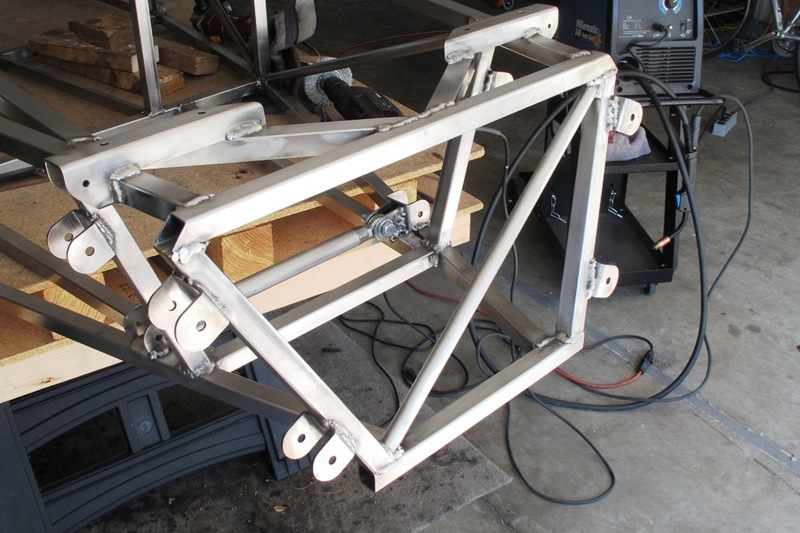 The Aussie's Ministry of Transport (if they have one—I just made that up) has determined that the stock Locost space frame chassis is far too flimsy to be safe in traffic. They require it to be stiffened in key areas, like the floor pan, nose, transmission tunnel, and engine bay. Collectively, these frame stiffeners have come to be known throughout the Locost world as the "Aussie Mods". We don't ever plan to take our Locost down under. France, sure, but not Australia. Still, any Locost builder can benefit from adding the Aussie mods to their frame, with the only downside being that no one seems to know exactly what they are. 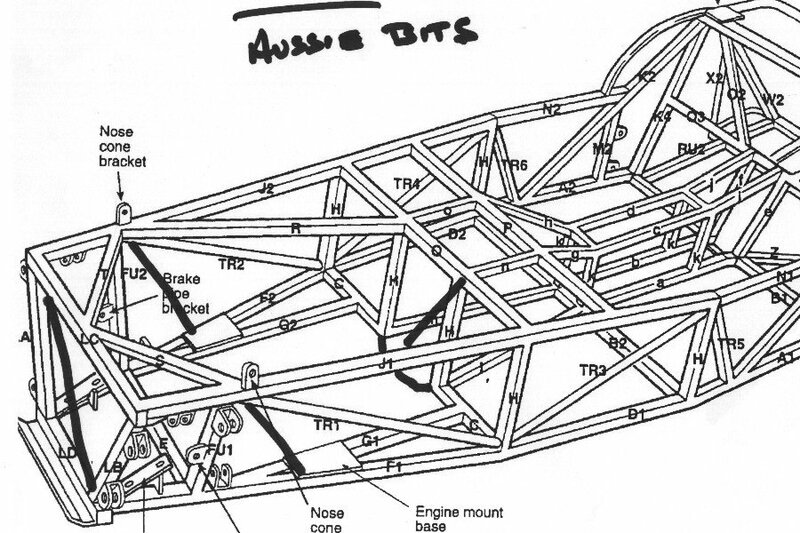 The only known Internet diagram of the Aussie Mods shows a book Locost chassis with the extra tubes drawn in with a Sharpie. And not drawn all that well. A page of text accompanies the diagram, but it's written in Australian, which sounds sort of like English until you realize key words are missing. 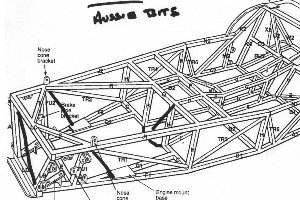 Our best guess so far on the Aussie mods is that you add a cross-tube to the nose, which is easy enough, and also tubes across the floor, which is an excellent idea because it places more metal between me and the ground. After these tubes, though, things become a little less clear. It looks like you add tubes to the engine bay, but you can't really tell from the Sharpie lines what you're supposed to attach them to. Stiffening the transmission tunnel is apparently done without tubes, which makes it that much harder to understand. 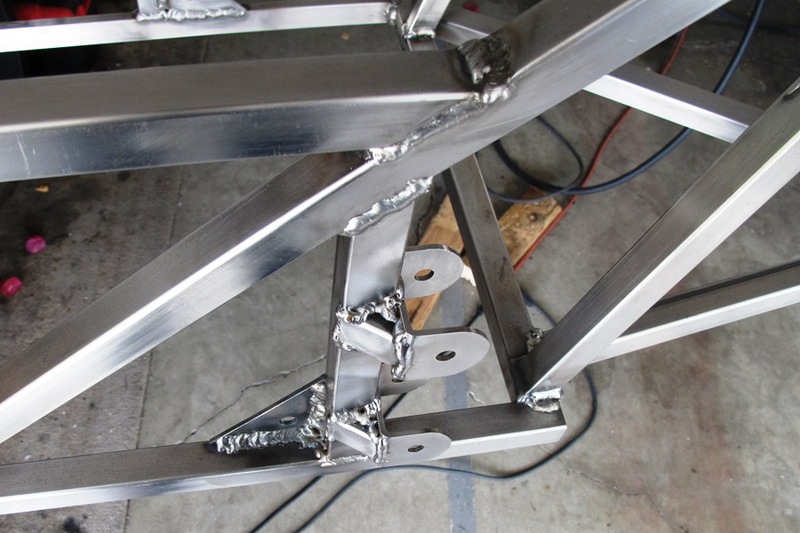 So with precious little to go on, we fit floor and nose tubes to our chassis and welded them in. The increase in stiffness wasn't immediately apparent, but that could be because the frame is resting on a table, and not pulling 2 g's through Maison Blanche. In any case we're now half-Aussified, and therefore safer than if we'd done nothing, but of course not as safe as Locost-driving Aussies. We might add more tubes to the engine bay down the road, but we're not going to do that until we've fit the engine in the chassis. No sense taking any chances. Incidentally, we weren't sure about the direction of the nose tube. It seemed natural to run the tube from the lower right corner of the nose to the upper left, but since this mod originated in the southern hemisphere, we may have it backwards. The drawing seems to indicate that's the case. Still, we're thinking it should be almost as effective this way. In the area of chassis-stiffening, we also welded gussets onto our rear suspension pickups. These gussets aren't described in the book, but rear suspension brackets have failed on many Locosts because they flex under load until they fatigue and break. We chopped our gussets from 16 gauge square tubing, but the first ones were way too big, so we kept chopping them down until they were too tiny to hold, and then welded in what was left of them. There's more metal in the beads than the gussets themselves, but we're as confident as any Aussie that the brackets won't break. Im grateful for the blog. Really Cool.